The sound of a coin sliding down the machine slot. That familiar sound of your favorite game booting up with cheesy 8-bit music. Blasting your way through space invaders, asteroids, and even trying to cross traffic. Those things may very well have been part of your childhood. If not those classic arcade games, then perhaps gaming on another level. May it be table-top RPGs, to video games, or maybe even a good game of Risk now and then. 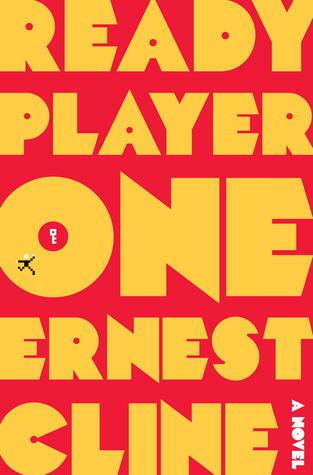 Whatever your gaming guilty pleasure be, Ernie Cline’s 2011 hit break-out novel Ready Player One is guaranteed to resonate with you on some level or another. Heck, even if you are a fan of 1980’s music, fashion, films, etc. ; if you grew up in the ’80’s – this is the book for you! Let me give you a little background on Cline’s first book. In the year 2044, Wade Watts is a seventeen-year-old kid who does not have much going for him. Both of his parents are dead, he lives in a double-wide trailer with his aunt, her ex-con of a boyfriend, and two other larger families. He is also a social outcast and finds solace in a place known only, fittingly, as the OASIS; which stands for Ontologically Anthropocentric Sensory Immersive Simulation. The OASIS is the go to place for anyone and everyone who wants to kill time virtually while remaining idle in reality. For Wade, the OASIS is the only place he wants to be jacked into 24/7. When James Halliday, the owner and CEO of Gregarious Simulation Systems passes away, it is revealed that he has set up his entire estate (money and GSS included) as an Easter Egg somewhere in the OASIS. To find the Egg, groups of people who call themselves “gunters,” short for “egg hunters,” must complete different tasks in order to obtain three keys; one made of copper, one of jade, and the final key made of crystal. These keys are spread out among the many worlds that inhabit the OASIS; hint: too many to count! Wade, under the virtual handle Parzival, is among the many gunters fighting and solving his way through the OASIS for that sweet grand prize. Along the way he meets many friends and plenty of enemies, including a rival company wanting to take over the OASIS for themselves and corrupt it. His best friend in the OASIS is another player named Aech. He and Aech challenge each other and help the other grow. Though they have occasional differences, they are more tightly knit than Gandalf and Bilbo. Throughout his journey, Wade meets a fellow gunter named Art3mis (pronounced Artemis). Having been an admirer of her’s for years, he may have had a geek-out moment when finally meeting her. They too had a rocky start, but soon became close friends in battle. I won’t give too much away of the story – there is just too much content to give an accurate summary without spoiling it. And who loves spoilers? Okay, I do. But that’s beside the point. This novel is my top favorite. I first read it before it was actually published (I was in a book club where we would receive advanced copies); I instantly fell in love with it. I was not much of a gamer when I read it, still not a complete gamer, but that’s okay! You really do not need to be an advanced gamer to love this book. It is chock full of 1980’s gaming references (Dungeons and Dragons among them), and other references just streaming out of the 1980’s – mostly films, cartoons, and television shows; among others that are not that hard to miss. The humor is sometimes subtle, can be a bit deadpan, but altogether enjoyable and hits the mark in some places. There is mild language and innuendo – both of which are not too terrible really. I mean, c’mon, it’s not a Tarantino film. Can’t be too terrible, right? In all seriousness though, Cline does a great job of writing relatable characters and a plot that moves along quite well. I highly recommend reading it. Especially if you are not a fan of gaming and the like, still, give it a chance. You may get hooked and want to join Parzival on his quest! Brandon is a recent graduate of Cornerstone University; having earned his BA in Humanities. He fancies himself a big geek/nerd. He’s into, among many other things: comic books (Marvel/DC/Image, mostly), Doctor Who, a little bit of Pokemon (he’s not too familiar with current generations! ), reading (he cites Ernie Cline, Raymond Chandler, and Jane Austen being among his favorite authors), gaming (League of Legends, Skyrim, Assassin’s Creed, and Pokemon: White being among his favorites), watching a myriad of film genres (his favorite film currently is Big Hero 6), and listening to music (his music tastes are as varied as his other hobbies; that is to say: widely!). He has been loving his time here at TGI and cannot wait to see what is in store for him in the future!